Sydney Brackett began writing in 2007 for the San Francisco State University Health Center and has written various patient-education materials for the school's nutrition department. Brackett is a registered dietitian and has a Bachelor of Science in dietetics from San Francisco State University. The roots of the ginseng plant have been highly esteemed in Chinese medicine for centuries. Ginseng is believed to treat a variety of conditions, such as high blood pressure, high cholesterol, type 2 diabetes, cancer, hepatitis B, chronic obstructive pulmonary disease, coronary artery disease and dementia. It also has been shown to enhance immune function and relieve asthma symptoms. Ginseng root contains active chemicals called ginsenosides, thought to be responsible for the herb's medicinal properties. The root is dried and used to make tablets or capsules, extracts, teas and creams. Ginseng literally means “man’s root,” and refers to its healing properties for humans. Ginseng tea has a sharp and coppery taste with a strong aftertaste and a bright yellow appearance. The benefits of drinking ginseng tea have been compared to those of eating fish, which is also considered to be food for the brain. Ginseng tea is thought to provide energy throughout the day by stimulating the brain, improving concentration and thinking power. Ginseng also is believed to be an appetite suppressant, helping curb sweet tooth cravings, and is used as a weight loss aid. Ginseng tea is known for the cooling effects it has on the body, and is believed to help minimize stomach pains, menstrual cramps and generalized discomfort associated with menstruation. Ginseng tea is made by soaking 3 grams of fresh ginseng root or 1.5 grams of root powder in 5 ounces of boiling water for five to 15 minutes and then straining. 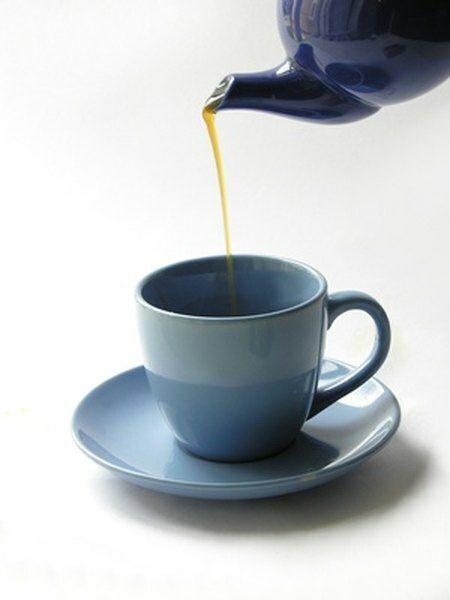 You can consume the tea three or four times per day for three to four weeks. Ginseng should not be used by pregnant or nursing women. Due to the estrogen effects of ginseng, people with endometriosis, uterine fibroids and breast, ovarian or uterine cancer should avoid ginseng. Ginseng has been shown to reduce heart rate and should not be used by people with heart disease or those taking heart medications. Ginseng may reduce the effects of blood thinning medications warfarin and heparin. If combined with ginseng, antidepressants may cause headaches, tremors, mania or insomnia. Ginseng also has been shown to reduce the effects of blood pressure medications and diuretics and increase the effect of blood sugar reducing medication. Interactions have been reported with cholesterol-lowering, anti-inflammatory, anti-cancer, antiviral and antipsychotic medications. Ginseng is not advised to be used with such medications.